What It Is: I *love* wrapping gifts – and I happen to be half-decent (but not a seasoned pro) at it. That being said, MANY people in my life – the fiance included – are pretty freaking terrible at crafting prettily wrapped gifts. 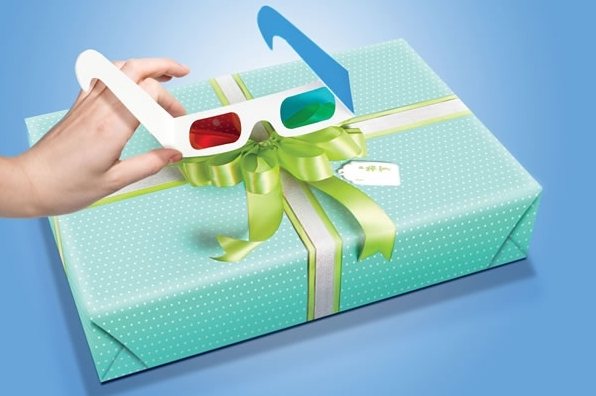 If you believe the presentation is just as important as the gift itself (it does after all, build up anticipation) then try Fred’s awesome 3D wrapping paper, which comes equipped with a pair of 3D glasses to make the wrapping’s ‘bow’ actually pop off the otherwise 2D paper. Quirky and memorable – save it for those most special occasions. Who It’s For: Your girlfriend or wife, when you want to make a big impression but quite literally aren’t equipped to. Your goofy little brother’s 30th birthday, for a gift he’ll remember for years to come. Your designer friend, because nothing quite says hipster like paying more for wrapping paper that offers less. Where It’s At: In Canada, you can stock up at ROLO. Sunny Days bonus entry: tell me in the comments below – are you good with gift wrap? Would you splurge on this silly wrapping idea? i would spurge.. i am OK at wrapping gifts.. I love wrapping gifts & am pretty good at it. While this paper is certainly a novelty I wouldn’t bother with it. Too expensive. I’m okay at wrapping but would definitely splurge on this to add some interest and fun to a package. I’m okay at wrapping but it’s not the wrapping that make a great gift, it’s the gift. I’d rather spend the extra on the gift. I’m great at wrapping gifts but prefer to use something that is reuseable (like a tea towel or scarf) or I use brown craft paper and decorate it to make it personable. I am awesome at wrapping gifts! 🙂 My mom and sister always get me to wrap their presents. I love wrapping presents and I’m okay at it. I would splurge on this. Sunny Days bonus entry: I used to be good with gift wrap, then I got complacent. Probably wouldn’t splurge on this silly wrapping idea? I am no expert but I wrap gifts just fine. I would splurge if I was needing to wrap a gift on the spur of the moment. I’m terrible at gift wrap. I rush, and it ends up looking like it was wrapped by a five-year-old. So in theory I like the idea of the the 3-D giftwrap, but I’d probably gift it to someone more wrapping-enabled.